Describing his work as a "labor of love," Mr. Summey's beautiful illustration of the chapel is set in a winter evening scene with the moon in the background and stained glass windows aglow. Limited-edition prints are available for $100. The artist hand numbered and signed each unframed print. The unframed, limited-edition prints are available through the the Alumni Office. Image size is approximately 16" X 24". To request your print, please complete the online form or call the Alumni Office at 417-690-2208. All proceeds go toward the Alumni Center’s Endowed Maintenance Fund. 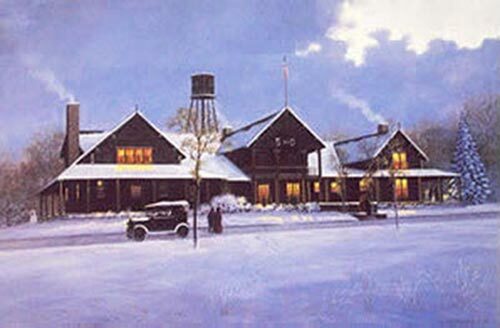 Noted Missouri Artist, Charles Summey, painted this version of Dobyns Hall, the first building at The School of the Ozarks and the model for the new Keeter Center. The unframed prints are available for $100, and are hand-signed and numbered. Mr. Summey added an extra marking to a limited number of prints which makes them unique from others; they are available for an additional $20. Image size is approximately 16 x 24 inches. To request your print, please complete the online form or contact the Alumni Office at 417-690-2208. All proceeds will be applied to the Alumni Center’s Endowed Maintenance Fund. Mr. Summey is recognized as a leading western and landscape artist, and is well known for his paintings of mountain scenes, wildlife, trains, and early Americana. His original oils can be found in corporate and private collections throughout the United States. 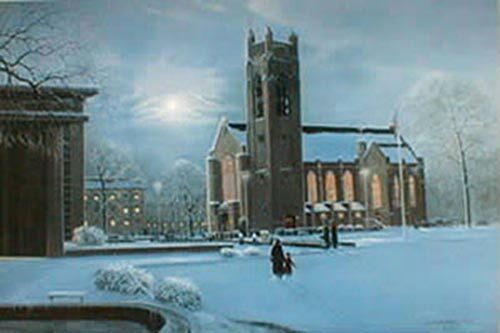 Limited edition, unframed, numbered and signed prints of Williams Memorial Chapel or Dobyns Hall.